Very happy with my nail cut today. Toes feel a lot more comfortable and have confidence in using your services again. Also lovely to chat and get to know you a little. I have gained nearly 20 years experience within both the NHS and the private sector giving me the ability to cater for all lower limb requirements including specialist areas such as diabetes, wound care, Biomechanics, gait analysis, musculoskeletal, nail surgery and paediatrics. After graduating from Northampton University School of Podiatry in August 2000, with the aim of becoming a musculoskeletal podiatrist, I started working full time for Southwark PCT – Foot Health department for 2 years. I managed 2 large clinics and specialised in nail surgery, routine and diabetic foot risk assessments. I also worked closely with a musculoskeletal specialist and subsequently grew in experience of musculoskeletal podiatry, injection therapy and in using the pedar pressure plate system. In 2002, I married Paul, who grew up in Worcester and together we started the next stage of our life here. I worked in the NHS in Worcester, Redditch and Bromsgrove, and had some private patients in their homes. In the Princess of Wales Hospital, I specialised more in foot ulcers, whether they were due to diabetic neuropathic/neuroischaemia, or other disorders such as Rheumatoid Arthritis. A few years later, there was a backlog of paediatric patients and adults with musculoskeletal pain and so I moved towards my first love of treating adult and childrens’ structural and muscular foot problems. Since then, I have left Worcester NHS and joined Gloucestershire Health and Care Trust as a Musculoskeletal Specialist in Cheltenham and started a Private practice in Barbourne Health Centre, Worcester. I now give complete podiatric treatment and advice private patients at Barbourne Health Centre to solve heel pain, metatarsalgia (forefoot pain), ankle pains and bunion tenderness as well as corns, callus, ingrowing toenails, high risk feet (diabetic or other medical problem). To improve on the treatment available to patients, I have passed an accredited acupuncture course and completed a Post Graduate Diploma in Cardiff Metropolitan University entitled The Musculoskeletal Studies of the Lower Limb (MSc). 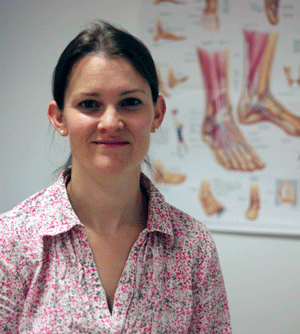 Whatever foot issue you have, from plantar fasciitis to an ingrowing toenail, Nicola has the experience to help you. Click the button to help you work out what appointment you need to get you back doing the life you loved.